Looking for another simple healthy dinner recipe when you don’t have a lot of time? 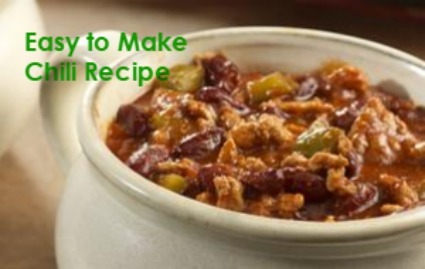 Here is an Easy to Make Chili Recipe that the whole family will love. This recipe serves 6 so if you have 2 in your house like we do now, we have enough for 3 meals each. Yay! If needed, double up the recipe so you have plenty to have later in the week or freeze for future meals. For my plant-based peeps, simply leave out the ground turkey! 😉 This recipe is healthy, low glycemic, gluten free, dairy free and soy free. Cook the turkey, onion, chili powder and cumin in a 4-quart saucepan over medium-high heat until the turkey is well browned, stirring often. Let simmer to blend the flavors. Then add tomatoes, green pepper and beans and simmer. Add a side salad or side of veggies and your meal is done! Do you like having easy to make recipe ideas? I would love to hear what simple healthy recipes you enjoy. Feel free to share this recipe and drop me a comment if you like this simple recipe. Did This Easy to Make Chili Recipe Help You? If so, I would greatly appreciate if you shared on Facebook & Twitter. Helping Women Crack the Code to Living a Healthy Lifestyle & Loving Their Body! PS: Tired of dieting? Make sure to grab my free download at the top right hand side of the page.